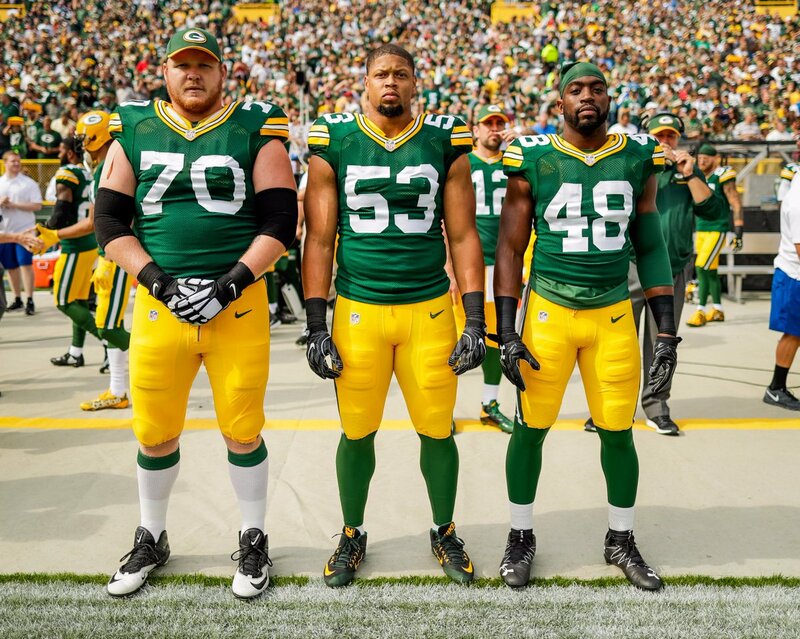 TJ Lang, Nick Perry, and Joe Thomas were captains for the game. ~For a half, it looked like 2014 again. At the half, the Packers led 31-10, and Aaron Rodgers was on his way to a monster game with four first half touchdowns. Then it was 2015 all over again. By the end, Rodgers finished with those same four touchdowns, and the Packers had hung on for a one-touchdown win, 34-27. 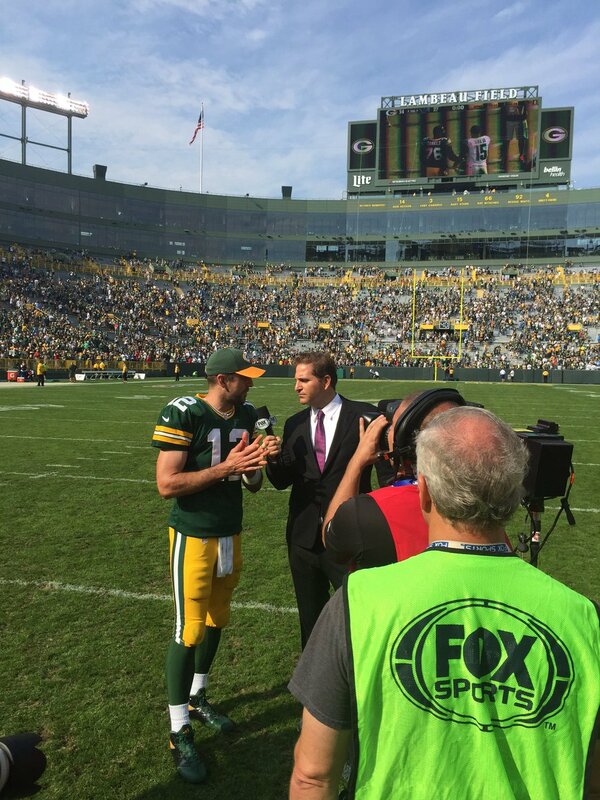 Rodgers talks to Fox Sports on the field after the victory. Eddie Lacy sealed the deal late, as he rushed 17 times for 103 yards, averaging 6.1 yards per carry. When McCarthy fools the defense and passes on first down, and runs on unpredictable second down, the defense is on their heels and the offense tends to roll. Jordy Nelson catches his second touchdown Sunday at Lambeau Field. Just three games in, Nelson has caught four touchdowns already, with scores in each game. Next week, a bye. Then Eli Manning and Odell Beckham visit Lambeau on Sunday Night Football in America. The defense was missing Clay Matthews, Sam Shields, Morgan Burnett, Datone Jones, and LeTroy Guion. Those are five good players, with Matthews obviously better than good. For the second week in a row, Green Bay’s pass defense struggled frequently. Damarious Randall, who did have an interception, was picked on throughout the game again, and the young secondary could not stop Marvin Jones or tight end Eric Ebron in the middle of the field. Up 31-3, the Packers offense put it into prevent mode, while the defense failed to cover tight ends or journeyman receiver Jones. Randall tried to put Jones into Canton, just a week after he tried to give Stefon Diggs a ticket to the Pro Bowl. Quinton Rollins also was beaten for a key third down conversion, by running back Theo Riddick. He and Micah Hyde were beaten quite a few times by tight ends and running backs. I have been a huge advocate of Rollins, but it’s been a bit concerning seeing him get beaten a few times this year as he has. Shields might not be back for awhile, if ever. His concussion history is starting to get scary. Burnett has been hobbled for much of the past few months. New tight end Jared Cook hurt himself too, when he dropped a pass and then relaxed as he was being tackled. There’s no word yet how long he’ll be out or what the extent of the injury is. With all the injuries mounting, maybe the Packers week four early bye isn’t too early afterall. ~No matter how many times Aaron Rodgers tells Packers fans to R-E-L-A-X, there’s always a R-E-L-A-P-S-E.
Green Bay fell to only 1-1 with Sunday night’s tough 17-14 loss at reigning NFC North champion Minnesota, but Rodgers still had to remind everyone the cheese wasn’t melting after the game. There are least five great reasons to trust Rodgers, too. The offense is a promising work in progress. This isn’t the mess of 2015 when Jordy Nelson’s knee injury sent ripples through the whole receiving corps, the offensive line was in shambles and Eddie Lacy was a few cheeseburgers heavier. This also isn’t the well-oiled scoring juggernaut that Rodgers has operated in the past, but it can get there. Through two games, Nelson is on his way to returning to full speed as an elite No. 1, and Randall Cobb and Davante Adams have settled back into their complementary wideout roles. The two new key starters, left guard Lane Taylor and tight end Jared Cook, are learning to mesh with the rest. Lacy has looked like his old power self, and has earned the right to get his bigger workload back after two solid games with limited volume. At some point, the Packers will get more of their receiving depth involved. Rodgers is too smart to not readjust his game. Rodgers typically is a lot more secure with the ball, and despite the continued pressure on him, there are flashes of protection in key situations to think it will be more consistent when the line fully has cohesion. The Packers also have shown good signs with their third-down and red zone efficiencies. What also was lost in the limited stats against a swarming Vikings defense was how many cheap penalty yards Rodgers got by targeting Trae Waynes — before that interception. He’s too talented, too. 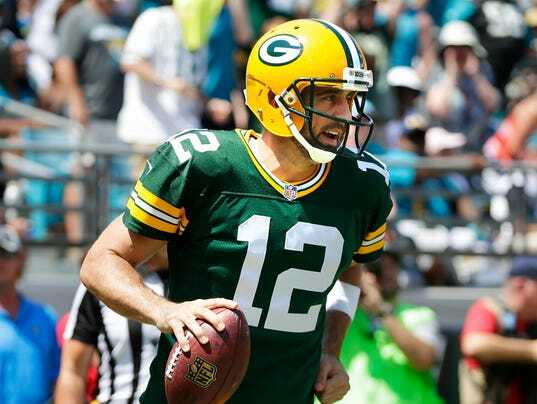 The gaudiness of Rodgers’ numbers aren’t there yet, but his grittiness never goes away. He knows he has to find the right blend of his athletic improvisation to make big plays and quick delivery on short to intermediate ones. There are ridiculous expectations for Rodgers to zip it and move the ball because of what he has done in the past. Rodgers already is very good at his “worst,” and with a stronger supporting cast, there’s not much he needs to do to return to his elite best. The defense will keep them in position to win any game. The Packers entrusted young inside linebackers Jake Ryan and Blake Martinez to shore things up. So far, they have stuffed the run better than any team in the league. They just rendered Adrian Peterson into a non-factor before he was hurt. Because they are better at winning those early downs, it’s revved up Clay Mathews and the pass rush on third downs. Matthews no longer is needed to clean up the mess in the middle, and is back to wreaking pure edge havoc. That formula is bound to raise the takeaway quotient given how many playmakers the Packers have on the back end, led by Ha Ha Clinton-Dix. The shorter fields are coming to assist the offense. They haven’t even played at Lambeau Field yet. The reward for opening with two grinders on the road are four straight games in Green Bay, with a bye in between. That gives the Packers a chance to make some early personnel and scheme tuneups and get on a nice winning streak before midseason. Their schedule overall is still cake. As a reminder, the Packers have the “easiest” 2016 slate in the NFL, based on their opponents’ combined winning percentage (.457) from last season. Playing at the Vikings was the most daunting matchup. Their hardest two remaining games are against the Texans and the Seahawks, and both of those are at Lambeau to open December in Weeks 13 and 14. They weren’t that far from finishing at Minnesota, and then the conversation would have been about running the table than running on empty. Take those five and chill. The Packers are set up to be a lot stronger in the end than the beginning, and that’s what really matters. Will the real Aaron Rodgers please stand up, please stand up? Or is this the new Rodgers? ~MINNEAPOLIS — When the shock of his three-fumble, one-interception performance against the Minnesota Vikings wears off — and that might take a while, given some of the things Aaron Rodgers did — there’s a bigger issue that needs to be addressed. When was the last time the Green Bay Packers quarterback thoroughly dominated a game? It certainly wasn’t Sunday night, when the offense stumbled through another erratic performance in a 17-14 loss to the Vikings in the first game at Minnesota’s U.S. Bank Stadium. We know it wasn’t the week before, when the defense saved the day in a season-opening win at Jacksonville. At some point soon, the Packers need Rodgers to play like a two-time MVP. Regardless of the circumstances around him — whether playcalling, game planning, receivers, running backs or offensive line — Rodgers left U.S. Bank Stadium saddled with his 14th straight game under 100 in the passer-rating department. This from a quarterback who began this season as the NFL’s all-time passer-rating leader (104.1). His most recent such game came in Week 6 of the past season, in an efficient, two-touchdown, no-interception win over the San Diego Chargers, and his most recent truly dominant stretch of football came in the second half of the Week 9 game last season at Carolina, even though that game ended in defeat. Playing what he described as “school-yard ball” after falling behind big that day, Rodgers nearly rallied the Packers with four touchdowns and 369 yards. Rodgers hasn’t posted a 300-yard passing day since the week after the Carolina game, and that came in an ugly home loss to the Detroit Lions, who come to Lambeau Field on Sunday. Jordy Nelson‘s absence was blamed, in part, for the offense’s slipping to 23rd in the NFL last season. Nelson is back and has touchdown catches in each of his first two games, yet the offense still can’t find its rhythm. Receivers aren’t open enough. Rodgers doesn’t appear to trust his protection, and the running backs failed on a couple short-yardage attempts: Eddie Lacy on first-and-goal from the 1 and James Starks on coach Mike McCarthy’s questionable fourth-and-2 decision. McCarthy refuted the idea that there is a carryover from the past season. Who could have imagined that Sam Bradford, in his first start for the Vikings, would outduel Rodgers? But it was Bradford who looked more comfortable in his offense. Rodgers completed just 27.3 percent of his passes thrown more than 10 yards downfield, according to ESPN Stats & Information, and he averaged just 6.0 yards per attempt with no touchdowns and one interception on such throws. Rodgers also struggled against pressure, as he completed just 33.3 percent of his passes against the blitz while throwing an interception and taking two sacks. When it was over, there were few concrete explanations for what happened. MINNEAPOLIS — Mike McCarthy, criticized at times for not taking a more aggressive approach, might have picked the wrong time to try to shed that label. “I liked the call,” he said. ~MINNEAPOLIS – Mike McCarthy’s third-quarter decision to pass up a short field-goal attempt. Aaron Rodgers’ two turnovers in the last seven minutes. The Green Bay Packers couldn’t overcome critical mistakes by their coach and quarterback Sunday night and went down to defeat at the hands of the Minnesota Vikings, 17-14, in another pulsating chapter of their Upper Midwest border war. McCarthy now has dropped two games in a row against coach Mike Zimmer’s team after sweeping the first three in their budding rivalry for supremacy in the NFC North Division. The Vikings improved to 2-0 and sole possession of first place. The Packers, playing their first two games on the road for the first time since 1924, slipped to 1-1. “It was an even game,” an NFL executive in personnel said afterward, and it basically was. The Vikings barely outgained the Packers, 284-263, and the time of possession was almost identical on a night when defense held the upper hand. In some ways, the first game played at U.S. Bank Stadium before a crowd of 66,813 was decided at the quarterback position. Zimmer went with Sam Bradford, acquired in a trade last month to replace injured Teddy Bridgewater, over journeyman Shaun Hill. With just two weeks of practice, Bradford completed 22 of 31 passes for 286 yards, two touchdowns and no interceptions. His passer rating was 121.2. He was little short of magnificent given the circumstances, the heavy pressure from the Packers’ pass rush and the loss of Adrian Peterson in the third quarter. “He looked poised for having practiced for just two weeks,” the scout said. On the other hand, Rodgers completed 20 of 36 for 213, one touchdown and one interception. He also fumbled three times. His passer rating of 70.7 marked the 14th straight game in which he has been under 100. In his five most recent games against Zimmer’s defenses, including a 2013 game in Cincinnati, Rodgers’ ratings were 64.5, 90.6, 65.5, 47.1 and 63.6. After losing a fumble inside the Vikings’ 45 with 6:53 left, Rodgers had the Packers positioned at their 45 with 1:57 left and three timeouts either to win the game or force overtime. But on third and 14, Rodgers threw a corner route slightly behind Davante Adams at the first-down marker in front of the Vikings’ bench. When the ball hung, backup cornerback Trae Waynes stepped in front of Adams for the game-clinching interception. In all probability, the Packers would have had 17 points if McCarthy had permitted Mason Crosby to try a field goal from 32 yards with Green Bay trailing, 10-7, in the third quarter. Instead, he went for it on fourth and 2 and James Starks failed to gain. When the Vikings had the ball in the first quarter, the Packers’ Mike Daniels was a dominant force. On the second play of the game, Daniels destroyed right guard Brandon Fusco and tackled Peterson for a 2-yard gain. The Vikings had to punt. On the Vikings’ second series, Daniels bull-rushed through Fusco and sacked Bradford for minus-8. The Vikings had to punt. On the Vikings’ third series, Daniels beat left guard Alex Boone to stop Peterson for minus-1, then shed left tackle Matt Kalil to halt Peterson for no gain. Again, the Vikings had to punt. The Vikings’ first snap of the second quarter was a run off left tackle by Peterson in which Letroy Guion defeated a reach block by center Joe Berger and smeared him for minus-4. This time, however, the Vikings didn’t have to punt. Offensive coordinator Norv Turner began to open up the offense. Bradford found tight end Kyle Rudolph for 19 on the left side, and then slot receiver Adam Thielen for 12 on an out-breaking route with Damarious Randall in coverage. Taking a major gamble, Zimmer disdained a field goal and went for it on fourth and 1. It paid off when Stefon Diggs caught a 4-yard pass against Randall. After two 5-yard penalties set up first and 20 at the Green Bay 24, Peterson gained 7 on a screen pass and Diggs found a window underneath for 9. The Vikings ran a two-man route on third and 4, with Rudolph running a corner route against man coverage from Morgan Burnett. On a contested catch, Rudolph hung on for an 8-yard touchdown. Late in the first half, the Vikings finally had a sliver of success on the ground when three carries by Peterson gained 11. On the next play, Turner dialed up a deep pass off play-action in which Diggs beat Randall for 44 on a finger-tip catch deep down the field. Clearly, the Packers missed Sam Shields (concussion). LaDarius Gunter replaced him at right cornerback. The drive bogged down when Micah Hyde, in as the dime back, wrestled Randolph down a yard short of the marker on third and 5. Blair Walsh followed with a 46-yard field goal and Minnesota led at halftime, 10-7. On offense, the Packers were rendered null and almost void by a Vikings’ defense that played without cornerback Xavier Rhodes (knee) and 3-technique Sharrif Floyd (knee). They finished the first half with just 65 yards (46 passing) and 11 minutes, 10 seconds of possession. Green Bay’s first play from scrimmage was a wild one. Adams caught a 3-yard hitch and fumbled on a strip by linebacker Eric Kendricks. Safety Andrew Sendejo scooped it up and was thinking touchdown, but Randall Cobb grabbed the ball from his arms and the Packers were back starting a series from the 10. After a three-and-out, Ty Montgomery blocked Jeff Locke’s punt and the Packers covered the 52 yards in five plays to take a 7-0 lead. On third and 2, Terence Newman was beat deep by Adams, and Newman was penalized 40 yards to the 4. A second-and-goal pass to Jordy Nelson fell incomplete but Newman was penalized for holding Nelson. On a play fake, Rodgers lobbed 1 yard to Nelson for the TD. Green Bay’s deepest penetration in its last four possessions of the second quarter was the Minnesota 47. Part of the problem was punter Jacob Schum. He punted four times in the first half, and just two were effective. His average was 37.3, and he had hang times of 3.78 and 3.66 on two of his boots. The Packers’ receivers struggled to get open, the Vikings’ pass rush was tenacious and Rodgers didn’t have great accuracy. Minnesota advanced to the Green Bay 44 early in the third quarter but Clay Matthews beat Kalil for a 7-yard sack to force a punt. The Packers reeled off as many first downs (five) on their second series of the second half as they had in the entire first half. Two of them came via infractions against Waynes, the second-year man from Kenosha Bradford High School. Rodgers scrambled for a first down inside the 25 but fumbled on a strip by defensive end Everson Griffen. Hustling downfield, tight end Jared Cook made the recovery at the Vikings 22. On first down, James Starks lost 2 on a big hit by defensive tackle Tom Johnson and linebacker Chad Greenway. Johnson exited with a head injury but returned a few plays later. A 10-yard pass to Richard Rodgers set up third and 2, but Rodgers missed Nelson in the left corner against rookie cornerback Mackensie Alexander and, disdaining a tying field-goal try, Starks was stopped half a foot short on fourth down. Peterson departed with 4 minutes remaining in the third quarter with an injury to his right knee. He left one play after Diggs ran a 15-yard skinny post against Randall that ruptured into 46. On third and 3, Bradford found Thielen for 5 with Joe Thomas in coverage. On the next play, Randall grabbed Diggs as he ran a vertical route. His penalty for pass interference was declined when Diggs continued the route and made a strong catch in the middle of the end zone for a 25-yard TD. Daniels shoved down Bradford after he released the ball. Griffen sacked Rodgers on the first play of the fourth quarter, setting up third and long. Rodgers ran up in the pocket and spotted Nelson, who was looking back for the ball and Waynes wasn’t. The gain was 39. On third and goal, Rodgers escaped between the hashmarks and ran straight to the end zone untouched for a 10-yard TD. An unsportsmanlike conduct penalty on Diggs for coming off the sidelines ruined the Vikings’ next possession and led to a punt. The Packers picked up three first downs, crossing midfield, before Rodgers fumbled on a sack by defensive end Brian Robison and defensive tackle Shamar Stephen recovered at the Minnesota 44. Robison slipped past Bryan Bulaga on an up-field charge. ~MINNEAPOLIS – The Green Bay Packers got back Jordy Nelson and signed Jared Cook in free agency, but two weeks into the 2016 regular season their offense looks a lot like last year. It starts at the top, where quarterback Aaron Rodgers has mixed occasional playmaking with some of the issues that plagued him last season: Holding the ball and throwing more errant balls than has been his norm. Then in Sunday night’s 17-14 loss to the Minnesota Vikings, a problem that has rarely plagued Rodgers cropped up on top of that: failure to take care of the ball. One of the three times Rodgers put the ball on the ground last night. He fumbled three times — there was a big element of luck that the Packers recovered two of them — and threw a crunch-time interception on a third down with the Packers trying to drive for the potential game-tying or winning score with less than two minutes to play. But Rodgers wasn’t alone. There were plenty of other ways this also looked like last year, when the Packers finished No. 15 in the NFL in scoring and No. 24 in yards. Among other things, there hasn’t been much in the playmaking department at receiver the first two weeks, just like last season. Remember the days when the Packers’ quick-strike ability struck fear in defenses as recently as a couple years ago? There was no sign of that at Jacksonville and Minnesota to start this season. On Sunday night, Nelson had a 39-yard catch in the fourth-quarter that set up a score, but the next longest reception was running back James Starks’ 16-yarder. Though Nelson made that play by going over cornerback Trae Waynes for the ball, his timing with Rodgers still looks off (11 targets but only five catches for 73 yards), and he isn’t getting much separation. Now, that well could be because he’s not yet in game shape after missing all of last season and the first four weeks of training camp while recovering from reconstruction surgery in one knee and a less severe injury in the other. Two months from now, Nelson could be playing more consistently and explosively, and the slow start will be nothing but a blip. But he is 31 years old and coming off major surgery, so there is reason to wonder how far back he’ll make it. We’ll see in December. Also, coach Mike McCarthy dressed all seven of his receivers Sunday night, yet essentially used only three: Nelson, Randall Cobb (five catches, 42 yards) and Davante Adams (three catches for 26 yards). You could count rookie Trevor Davis’ snaps from scrimmage on one hand, and second-year pro Ty Montgomery didn’t see the field except on special teams. And the kicker is, Nelson, Cobb and Adams combined to average only 10.8 yards a catch Sunday night. That’s a glaring lack of big-play production. Then there’s Cook, who in training camp flashed as a big, fast target who could add a missing dimension to the offense. In his first two games, though, the Packers haven’t gotten him the ball. He has five catches for a 7.6-yard average. In the second half, McCarthy did go to a two tight-end set (Cook and Richard Rodgers) for two series in what likely was an attempt to get Cook more involved. But it didn’t have much impact on a night when the 29-year-old tight end had four catches for a 7.8-yard average. No doubt, you can’t tell the story of this game without pointing out that the Vikings have the makings of one of the best defenses in the league. Their coach, Mike Zimmer, is one of the best defensive minds in the game, and he has Pro Bowl-caliber talent at every level of his defense: the defensive line (nose tackle Linval Joseph and end Everson Griffen), linebacker (Eric Kendricks and Anthony Barr) and defensive back (safety Harrison Smith). They held the Packers to only 263 yards of total offense; rendered halfback Eddie Lacy a relative non-factor (50 yards rushing on 12 carries), though McCarthy’s play calling bears responsibility there as well; and sacked Rodgers five times. The early take on the Vikings is that they’re shaping up to be a formidable team. But what a contrast to see Sam Bradford slinging the ball around in his first game with his new team, which he joined only two weeks ago, while watching Rodgers struggle. Bradford’s 121.2 rating demolished Rodgers’ 70.7. Bradford’s great weakness is immobility — he can’t make something out of nothing the way Rodgers can. But when Bradford had a little time he made several superb throws, right on the money with rushers in his face. He proved that whatever his faults, there’s no dismissing his arm talent and willingness to stand in the pocket and take your best shot. We’re only two weeks into the season, which is way too soon to make many big judgments. Strange things happen early. Teams can take several weeks to find their identity, and perhaps that will be the case with McCarthy’s offense. But some red flags are up. It’s time now for McCarthy and Rodgers to figure out how to put some pop back in their offense. Because a repeat of last year will mean this team’s going nowhere. ~JACKSONVILLE, Fla. – The Jacksonville Jaguars began a potential game-winning drive Sunday against the Green Bay Packers at their own 37-yard line with 3:17 remaining. Poor clock management left them with the two-minute warning and no timeouts. Trailing 27-23, they crisscrossed midfield after penalties on both teams, with a holding call against safety Morgan Burnett breathing new life into a bleak scenario. A 22-yard completion to Allen Robinson — who fumbled and then recovered his own mistake — moved the ball inside the red zone. With mere seconds remaining, the Jaguars were alive. But failed attempts brought them to fourth-and-1 with seconds remaining. Blake Bortles completed a pass to Allen Hurns on the right side, and the Packers stacked him up. For all intents and purposes, the Packers made a goal-line stand. They left balmy, swampy Jacksonville with a 27-23 win. Turning point: The Jaguars took the lead with 1:09 remaining in the second quarter when Bortles lofted a beautiful throw down the right sideline for tight end Julius Thomas on a 22-yard score. But 69 seconds was more than enough time for Aaron Rodgers and the Packers, who covered 75 yards in five plays for a go-ahead score. The touchdown gave the Packers a 21-17 lead. They did not trail for the remainder of the game. Big number: 630 — Days between receiving touchdowns for wide receiver Jordy Nelson, who caught a 6-yard score from Rodgers late in the second quarter. Rodgers rolled right and found Nelson in the back of the end zone. Nelson’s last touchdown was Dec. 21, 2014. What went right: Criticized relentlessly last season, the passing game for the Packers began slowly Sunday afternoon. Rodgers finished the first quarter 2-of-5 for 11 yards. But the offense chugged to life quickly and, by game’s end, demonstrated a few elements missing in 2015. There was a 32-yard completion to Randall Cobb, who generated separation down the middle of the field. A 6-yard touchdown to Nelson, who finished with six catches for 32 yards in his first game back since suffering a torn ACL. A dart-like throw from Rodgers to Davante Adams for a 29-yard score against skin-tight coverage from former Packer cornerback Davon House. The total passing yardage did not wow you, but the types of passes completed were a step in the right direction. What went wrong: Throughout training camp, cornerbacks coach Joe Whitt Jr. rotated his players through different positions in the secondary. All three of his second-year players — Damarious Randall, Quinten Rollins and LaDarius Gunter — took reps on the perimeter and in the slot, which the Packers call the “star” position in their nickel alignment. Randall began Sunday’s game on the perimeter with Rollins manning the slot, and they switched late in the second quarter. But Rollins had a very rough drive in the closing minutes of the first half, twice giving up huge plays. First he was beaten by wide receiver Hurns on a double move that turned into a 30-yard gain. Then Thomas got behind him for a 22-yard touchdown. The Packers went with Gunter in the star position to start the second half, and he was quickly involved in a pass to Hurns that yielded 38 yards. In total the numbers for Bortles (24-of-39 for 321 yards) were solid, but it was his ability to generate big plays burned the Packers at times.